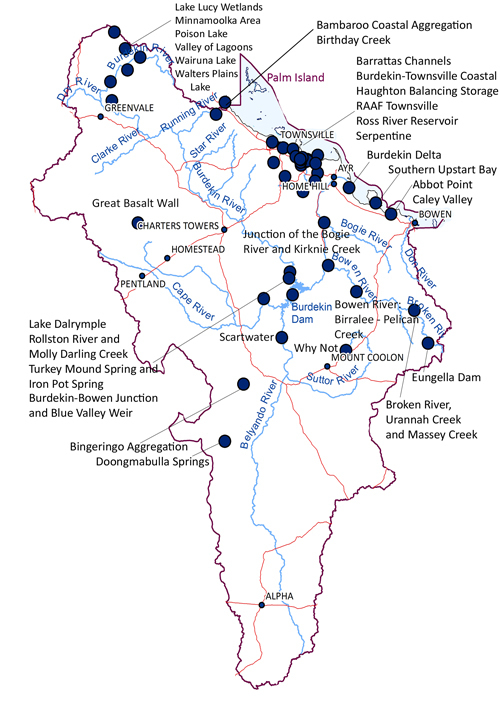 The Burdekin Dry Tropics’ rivers and associated wetlands are significant features, with 34 wetlands listed in the National Directory of Important Wetlands (see Figure 16). The Bowling Green Bay wetlands host regionally-significant populations of breeding waterfowl and waterbirds and are an internationally significant migratory wader bird habitat. Up to 50 per cent of the migratory species listed under the Japan-Australian Migratory Bird Agreement (JAMBA) and China-Australia Migratory Bird Agreement (CAMBA) occur in these wetlands. These are agreements between the Australian, Japanese and Chinese governments for the protection of migratory birds in danger of extinction, and their environment. Coastal wetlands are also important links to adjacent coastal waters and seagrass meadows that provide regionally-significant fish habitat and nursery areas, and are recognised as a productivity hotspot that supports major commercial and recreational fisheries. Our region contains approximately 280km2 of estuarine systems (mangroves, saltmarsh/saltflats and intertidal flats); 26 of these were assessed as near pristine (30%), largely unmodified (40%) or modified (30%) (Australian Government, 2015). The modified estuaries are Barratta Creek, Burdekin River, Don River, Haughton River, Ross River, Bohle River and Sandfly Creek. Catchment modifying factors include altered catchment hydrology, effluent pollution, irrigation tailwater, groundwater extraction, sand extraction in estuaries and floodplains, sewage treatment plants, dams, floodplain barrages and tidal weirs. Information on wetlands, including their values and management requirements, is contained in the WQIP and is available on a number of tools via Queensland Government’s WetlandInfo – Wetland Summary Tool, Aquatic Conservation Assessment and Walking the Landscape.